• Double Arm Medical Pendant is mainly used in big Operating Theatres/ Operating Rooms and Hospital Wards for supplying Medical Gases, Electric Power, and loading Medical Equipments. • Double over head suspension Horizontal. • 2- Arm system for OT. We are able to provide high-quality ICU Single Arm Pendant to our honorable customers. Prior to dispatch, our quality controllers ensure this pendant to be defect free in nature to meet the varied requirements of clients. Our offered range is manufactured employing sophisticated technology and the latest equipment to ensure rust resistant quality and reliability. To continue our goodwill in clients’ consideration, we are successfully engaged in offering a comprehensive range of Double Arm Pendant. Our provided product is stringently checked on varied quality parameters by our experienced quality controllers in order to deliver flawless delivery. Offered product is manufactured with the aid of a dexterous workforce and by implementing high-end techniques. It is made available at a reasonable price in different technical specifications as per our clients’ diverse requirements. We offer Hospital ICU Pendant to our prestigious clients. In order to deliver a defect-free range at clients' end, we thoroughly check the offered range on various parameters of quality. This product is manufactured using premium grade components and contemporary technology in conformity with set universally accepted norms of quality. Apart from this, our clients can avail it from us at industry leading prices in different technical specifications as per their requirements. • Single Arm Pendant used for Operating Theatres. • Medflo provides the range of quality ceiling pendants for anesthetic, surgery and monitoring purpose in Operation Theatre and Intensive Care unit, i.e. Fixed pendants, fixed rigid pendant, single arm movable pendant, double arm multi-movement, pendant, etc. 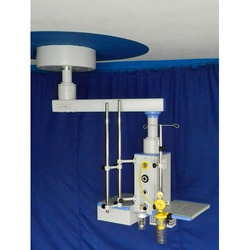 • Single over head suspension Vertical one arm system for OT gas terminal outlets. • Medflo pendant is a compact modular unit, which can be supplied in various configurations to meet the exact requirement of the hospital. The pendant consists of ceiling support, upon which a wide selection of arms can be mounted. • It has the greatest advantage to accommodate all Medical gas, Electrical services, Data communication services and facilitating equipment management. 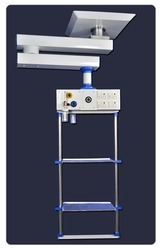 • Medical gas outlets configuration oxygen-2, Vacuum-2, Medical air-1, Medical air-7 bar-1, oxide–1 (Quantity Optional). • 1- Arm system for OT. 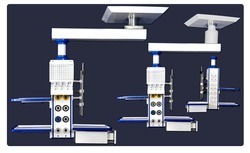 • Level degrees rotation; 0 - 340 Extension Arm and terminal. • The box can rotate together and separately. • Main socket: 10 no’s 5-15amps (universal standard). • The main material used the high strength aluminum alloy, the whole sealed design. • Arm High-Density aluminum alloy extrusion. • Ceiling mounted installation the reliable and firm. Looking for Medical Pendant ?